Scans of old BMX catalogs and adverts. I’m scanning all of my old BMX catalogs and printed adverts from the 80’s and 90’s, and I will put them here on the website gradually. 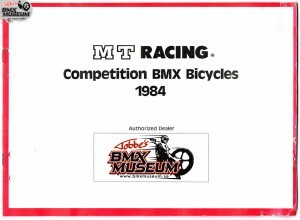 🙂 First out is the 1984 catalog from MT-Racing.